If you are looking to background calves or grow replacement heifers this winter grazing corn residue and providing supplemental distillers may be a system to consider. Photo courtesy of Troy Walz. Corn residue is an outstanding forage resource for wintering cows, but is also an option for backgrounding calves or growing heifers. Given the typical rental rates for corn residue and the cost of distillers’ grains, these two feed resources together make one of the lowest cost growing rations. To understand why distillers’ grains are such a good supplement for growing calves, one must first understand a little about how protein is used in ruminant animals. In ruminant diets, not all protein is created equal, and this is particularly apparent for animals with high protein requirements such as growing calves. Ruminally degradable protein is used by rumen microbes to grow (eventually, rumen microbes become a source of protein for the animal called bacterial crude protein). Ruminally degradable protein supplied in excess of the microbes’ requirements cannot be used by the animal as a source of protein. When the animal’s protein need is high, bacterial crude protein does not meet the animal’s demand, thus a source of ruminally undegradable protein (or bypass protein) is needed. Providing more ruminally degradable protein will not help in this instance. A good example of this concept is the comparison of urea as a source of protein vs distillers’ grains for growing calves grazing corn residue (Tibbits et al., 2016). Urea is 100% ruminally degradable, whereas the protein in distillers’ grains is only 37% ruminally degradable, meaning that 63% of the protein bypasses the rumen (is not degraded in the rumen) and can be absorbed and used as a source of protein for the animal itself. When a similar amount of energy (3.1 lb TDN/d) and protein (0.9 lb CP/d) were supplied by corn plus 5% urea (4 lb DM/d) vs. distillers’ grains (3.0 lb DM/d), the gain of calves receiving distillers’ grains (1.32 lb/d) was more than double that of the calves receiving the corn plus urea (0.53 lb/d). The difference in gain with urea and distillers’ grains emphasizes the value of bypass protein (or ruminally undegradable protein) for growing calves. 1.1 lb/d, calves would need to be supplemented with 1.8 lbs of DM, which is 2.0 lbs of dry distillers or 3.6 lbs of modified distillers. 1.5 lb/d, calves would need to be supplemented with 3.6 lbs of DM, which is 4.0 lbs of dry distillers or 7.2 lbs of modified distillers. 1.9 lb/d, calves would need to be supplemented with 6 lbs of DM, which is 6.7 lbs of dry distillers or 12 lbs of modified distillers. In forage-based systems, similar performance is observed with dry, modified and wet distillers’ grains as long as the same amount of dry matter is fed. It is important to note that the estimates are based off of calves being fed in a bunk. Feeding on the ground will increase waste and thus, increase the amount of distillers grains needed to be provided. In trials evaluating the waste with ground feeding, waste of 5% was measured for modified distillers, 20% for wet distillers and as much as 40% for dry distillers when compared to bunk feeding. 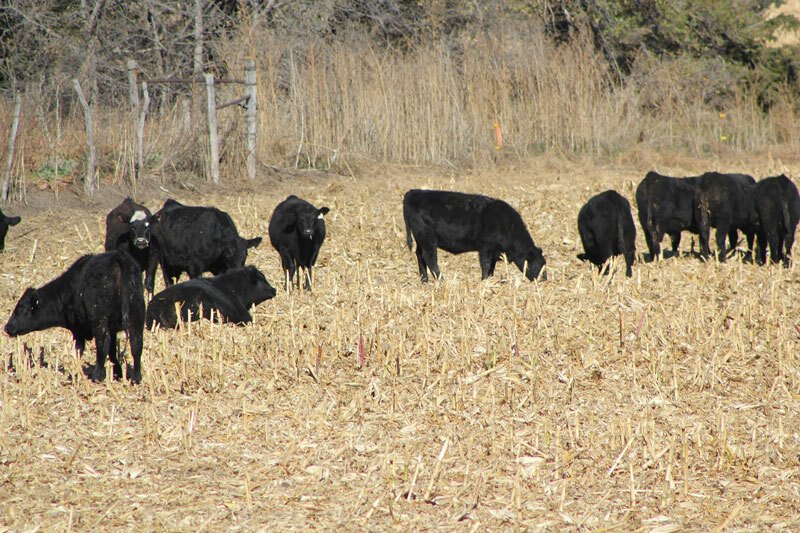 Low cost option for growing calves: Corn residue grazing with distillers supplementation. Welchons, C. A. and J. C. MacDonald. 2017. Pooled Gain Analysis of Steers Grazing Corn Residue and Supplemented with Distillers Grains. Nebraska Beef Report p. 34-35. Tibbitts, B. T., J. C. MacDonald, R. N. Funston, C. A. Welchons, R. G. Bondurant and F. H. Hilscher. 2016. Effects of Supplemental Energy and Protein Source on Performance of Steers Grazing Irrigated Corn Residue.